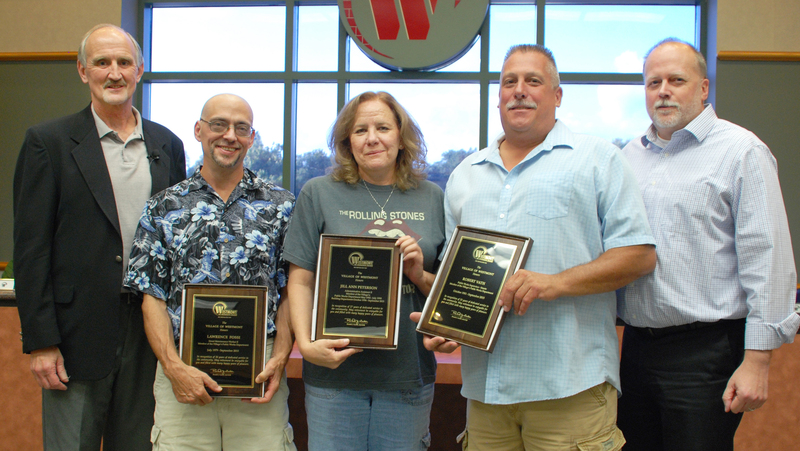 The Village of Westmont recently honored three long-time staff members who retired from service. Mayor Ron Gunter presented retirement plaques to Larry Fossi, Bob Vath, and Jill Ann Peterson and thanked them for their many years of service. Fossi started in 1979 and worked in the Public Works Department his entire career. Vath started in 1981 and worked with the Street Division his entire career retiring in the role of Street Division Supervisor. Peterson worked from 1982-1990 at the Water Division and then worked in Community Development from 1996-2015. The three retirees represent more than 90 years of service to the community. Pictures from the ceremony have been posted in the Village of Westmont Website Photo Gallery. The Village of Westmont thanks Bob, Larry and Jill for their years of dedication to the Village of Westmont and wishes them a long and happy retirement.